It's the cutest, easiest candy holder! 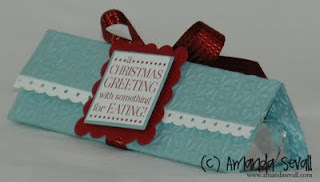 I followed a tutorial from this video and changed up the colors, stamps and embossing folder. This is one of my favorites I've made this month! What do you think?! Love these! Love that shade of red. I love the blue and red color combo Amanda! How very pretty!